Loyal to its creative tradition, Jaquet Droz continues to engage its watch models in a fascinating dialogue with contrasting materials and colours. 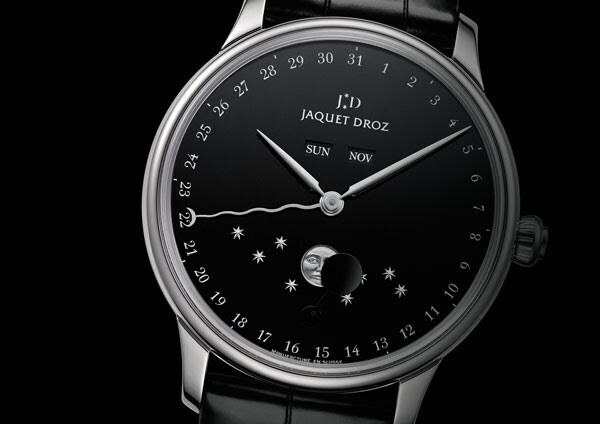 In harmony with its established mineralogical expertise, Jaquet Droz treats The Eclipse Onyx to the moon-phase complication and a dial carved from a black onyx disc. The mesmerising colour of the stone becomes a jewel case celebrating the radiance of the rhodiumed metal forming the eight stars, and the moon. An overshadowing racket-shaped piece, also cut out from black onyx and further enhancing this strikingly contrasting effect, gives splendid depth to this game of hide and seek played with the smiling face of the moon. Combining the power of metal and mineral strength, a delicate motif and mechanical complexity, The Eclipse Onyx subtly asserts its evocative power tinged with a decidedly masculine aura.